hablis is one of the great white wines of the world, and partly because the cultivation of the Chardonnay grape in these cool hills is so close to the limit of where obtaining full ripeness is possible. Success rarely comes easily, fraught with an annual battle against frost and rain, demanding constant diligence. The importance of fully ripe fruit cannot be understated. The wines should be vigorous, fresh, suffused with minerality but also with generosity and length of flavour without the greenness, harshness or indeed sulphur that some disciples have been duped into believing it was authentic Chablis character. So what defines that unique Chablis character? A fine, subtle gun-flint, smoke or stony mineral character and greengage plum aromas are typical – but these must be ripe plums. Some wines are more floral or appley, citrusy or peachy but there should still be an unmistakable minerally aspect and marvellous depth, with a toasty, nutty (or honeyed) complexity with age. The vintage matters greatly; while the longevity of Chablis should never be underestimated, most wines from a weaker vintage will evolve quite quickly and the leaness, often greeness on the palate will never disappear. Two major areas of debate in the past two decades have been the extension of the premier cru vineyard area and the use of new oak but as important to quality are the issues of yield (often too high) and mechanical harvesting, which is still widespread. The Union des Grands Crus in Chablis recently banned mechanical harvesting but many premiers crus are harvested in this way, in part due to the greater ease of using this method here in contrast to the Côte d’Or, where difficulties are posed by the more fragmented ownership of vineyards. Much of the argument over expansion of the vignoble concerns soil types and whether Portlandian, Jurassic and other limestones are capable of the same quality as fossilised Kimmeridgian limestone found in the established grands and premiers crus. The second area of debate is whether to oak or not to oak. There are now many good exponents of both schools of thought, though the style of each varies significantly. A grand cru from Domaine François Raveneau (aged in used oak) is a benchmark but most of the new oak versions from Drouhin or Verget are also of very high quality and have as much validity as those from the unoaked camp. Quality is the key, the question of style is more subjective and unless the oak overwhelms the wine it is down to personal choice. That said, Chablis should always taste of its origins and not be mistaken for something from the Côte de Beaune or further afield. 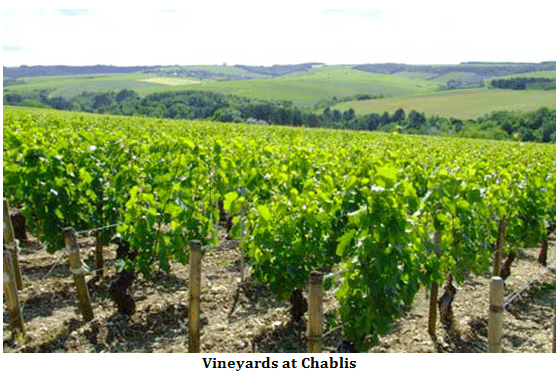 Understanding the Chablis classification is straightforward. The entire vignoble of more than 4600 ha (currently in production) is classified as one of four levels: Chablis Grand Cru, Chablis Premier Cru, Chablis or Petit Chablis. Such is the importance of the producer, however, premiers crus from the best estates can easily outperform weaker grand cru efforts. Almost eight times the area is designated Chablis Premier Cru, encompassing forty names. Less than half of these are in common usage as the main premier cru name is usually taken. Regrettably this precludes a better understanding of individual plots or climats within these large vineyard areas that could help in identifying both style and quality. However some producers (lately Verget but others too) are increasingly identifying a special plot by adding the lieu-dit name to the label – and for regular Chablis as well as premier crus. Broadly speaking, those premiers crus with the greatest potential to be fine are Fourchaume, Montée de Tonnerre and Mont de Milieu, all lying on the same side (northern, right bank) of the river Serein as the grand crus and with similar exposures. But poorer examples of these will be surpassed easily by the best versions of premiers crus from the other side of the Serein (left bank), especially Montmains, Vaillons and Côte de Léchet. The quality of regular Chablis (from more than 3000 ha) is very much dependent on the producer whilst Petit Chablis is, for the most part, best avoided. Most of the wines made in the area surrounding Chablis are made from Chardonnay, Pinot Noir or Aligoté. If conditions are generally less favoured in terms of soil and climate than in much of Chablis, it is possible to produce wines of reasonable concentration and sufficient ripeness in both colours from villages such as Coulanges-la-Vineuse and Irancy providing there is a fastidious approach to viticulture – the wines of Anita & Jean-Pierre Colinot are proof enough. Irancy is an AC for red in its own right; other villages are suffixed Bourgogne (Bourgogne Coulanges-la-Vineuse, Bourgogne Chitry) for red and white. Bourgogne Côtes d’Auxerre covers other villages in the vicinity of Auxerre (including Pinot Noir and Chardonnay from Saint-Bris-le-Vineux). Those from around Tonnerre, to the east of Chablis, are labelled Bourgogne Épineuil (for Pinot Noir) or Bourgogne Tonnerre (recently sanctioned for whites). Some growers are at least as successful with rosé as red. If the cultivation of Sauvignon in the Yonne seems unusual, consider that it’s a relatively short hop to the Central Vineyards of the Loire Valley from here. Few examples of Saint-Bris (Sauvignon from around Saint-Bris, Irancy and Chitry) are better than green and edgy, despite its promotion in 2003 to appellation status. The real exceptions are those from Goisot whose brilliant wines (not to be missed) also include Chardonnay and Pinot Noir, seemingly from another planet in quality terms. Further afield, some Chablis-like white is made some 50 km to the south of Chablis and Auxerre at Vézelay (Bourgogne Vézelay).